EPA Science Panel Casts Doubt On Air Pollution Dangers Some panel members said they don't agree that breathing sooty air can cause premature death. The panel's draft recommendations to the EPA would change how it assesses the dangers of air pollution. 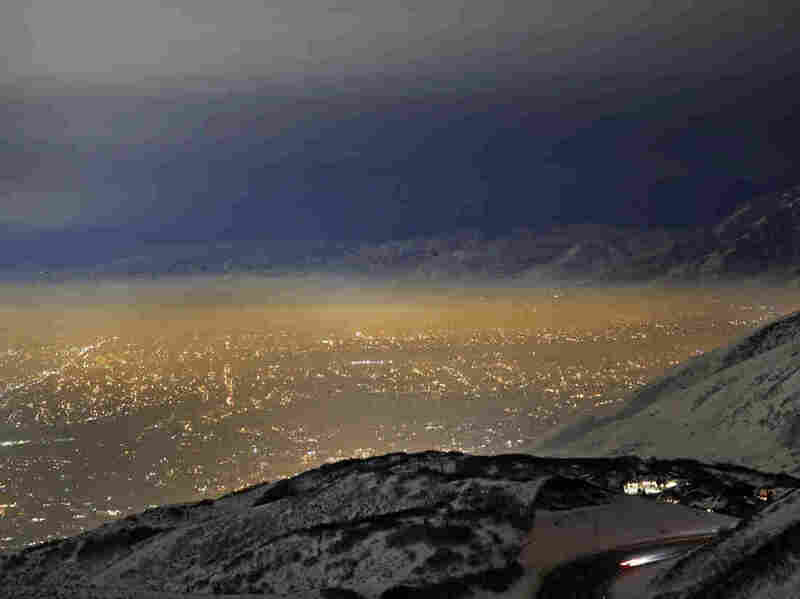 Smog fills Utah's Salt Lake Valley in January 2017. Winter weather in the area often traps air pollution that is bad for public health. The recommendations concern how the EPA regulates microscopic soot known as particulate matter, which causes and exacerbates respiratory diseases such as asthma. Determining exactly how much particulate matter is safe to breathe requires complex analysis of an enormous — and growing — body of scientific literature. Before the EPA disbanded it last year, a 20-person subcommittee called the Particulate Matter Review Panel was responsible for helping the agency decide how much air pollution is safe for Americans to breathe. With that group gone, only the seven-member Clean Air Scientific Advisory Committee is left to make recommendations. "[Committee] members have varying opinions on the adequacy of the evidence supporting the EPA's conclusion that there is a causal relationship between [particulate matter] exposure and mortality," said Cox, reading from the committee's draft recommendations before explaining that he is "actually appalled" at the lack of scientific evidence connecting particulate pollution to premature death. "This is waving a red flag in front of a bull, so I acknowledge that," Cox continued. The draft recommendations would dramatically limit the breadth and depth of the science used to determine safe air pollution limits in the U.S. by pushing the EPA to limit the types of studies considered during the regulatory process. The EPA currently bases its air pollution regulations on a wide range of scientific studies about the relationship between health outcomes, such as asthma or premature death, and different types of air pollution, such as soot of different microscopic sizes. "The EPA has a very well-vetted process that has been going on over the years called the weight of the evidence," says Francesca Dominici, a biostatistician at the Harvard T.H. Chan School of Public Health who recently wrote about the draft recommendations in the journal Science. "This is a process that has been endorsed not only by the EPA, but by the National Academy of Sciences, [and] is pretty well accepted by the scientific community." "Every time you try to assess the link between exposure to a contaminant and health," Dominici says, "you have to make sure there is consistency in the evidence across many, many studies, across many disciplines," including atmospheric chemistry, toxicology, epidemiology and exposure, and data science. That's important, she explains, because no one study captures everything about a given pollutant. "You can't randomize millions of [people] around the world to breathe higher pollution or lower pollution, so we have to rely on observational data," Dominici says. Decades of broad analysis have enabled scientists to make clear recommendations to the EPA about how to protect Americans from air pollution. "They're providing a very robust message that air pollution is harmful to human health," Dominici says. But at Thursday's hearing, Cox and others expressed concern that the current system overstates the scientific certainty around air pollution. "If we don't know that X causes Y, then we should say we don't know," said Cox, who consults and lectures about various risk-related topics. He expressed concern that the EPA would move to reduce air pollution under the erroneous assumption that it would result in fewer premature deaths. To avoid that, Cox has shepherded through recommendation language that emphasizes uncertainty about the relationships between air pollution and respiratory disease. If the EPA adopts those recommendations, many scientists warn it will lead the agency to underestimate the effects of air pollution on public health. "I just want to emphasize the fringe nature of these proposals," says H. Christopher Frey, a former chair of the Clean Air Scientific Advisory Committee and member of the now-disbanded particulate matter review board. "It's kind of like the same issues that came up with tobacco denial of health effects or denial of climate change health effects," Frey says. "There's a very small community that have scientific credentials but are moving outside their area of expertise to try to raise doubt after doubt after doubt on issues where they really don't have the strongest competence." "There are other experts who are much stronger, much better informed, much more aware of the leading edge," he argues. In a surprise development, the full panel appeared to agree that other experts should be brought in to review the current recommendations. Members are calling on the EPA either to reinstate the disbanded 20-person panel of particulate matter experts or to create a new expanded panel with even broader expertise to review the recommendations of the Clean Air Scientific Advisory Committee before they become final.